The festival is a great opportunity for some indulgent sampling while benefitting a great cause. 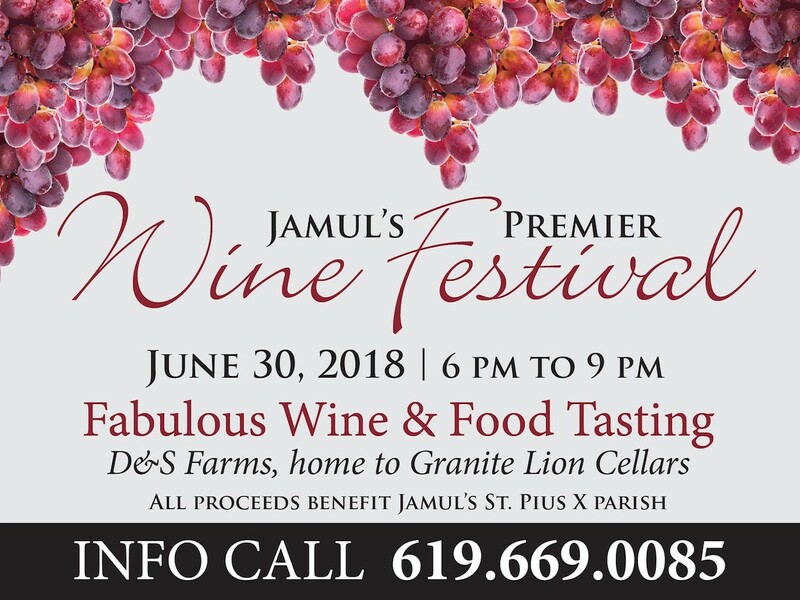 (1888PressRelease) May 15, 2018 - SAN DIEGO – The best of San Diego County’s wineries, fabulous food, and vintner insights on wine production are on tap at the third annual St. Pius X Catholic Church Wine Tasting Festival Saturday, June 30, 6–9 p.m., at The Grove at D&S Farms, home to Granite Lion Cellars. All proceeds will benefit Jamul’s St. Pius X parish improvement fund and youth programs. •	Novo Brazil Brewing Co.
Attendees will also enjoy sumptuous appetizers by local chefs and restaurants, including Valentin’s Bar & Grill and Crafted Greens; live music; a silent auction; and presentations by industry professionals including Linda McWilliams, Former President of San Diego County Vintners Association, and David Whited, Sommelier. The event is open to the public (21 years of age and up). Advance tickets are $65 per person or $100 per couple. Ticket prices at the door are $75 per person. Tickets can be purchased at stpiusxjamul.com or by calling St. Pius X, Jamul, at 619-669-0085.